Serije bomo maja postavili na stran in se na dan mladosti vrnili tja, kamor se večinoma vračamo vsak dan. Domov. Pogledali si bomo, kakšna je situacija v različnih stanovanjih istega bloka. Kdo sesa parket v nedeljo ob desetih zvečer? Kdo v resnici posluša Backstreet Boys? Ali se sosedje nenehno prepirajo ali pa so morda Italijani? Kdo kadi na hodnikih in kdo se na hišnih svetih največ oglaša? Vse to in še več v tokratnem formatu BLOK MLADOSTI. Ker bomo domov povabili tudi goste iz tujine Improholics, bo predstava potekala (večinoma) v angleščini. Upamo samo, da bodo prinesli copate. Na dan mladosti vas po predstavi kolektiv Gverila teatra vabi na zabavo, kjer bodo Gverila DJi (Delish, Gansh, Shola, Kishta, Shano) poskrbeli, da se boste zavrteli v kolažu funka, housa in techna ter mnogih hitov, ki jih najdemo vmes. Obeta se celovečerna akcija za vse željne plesa in veselja na plesišču. We will press pause on the Gverilaflix series in May and return to where we mostly return every day. Home. We will take a look at the everyday life in different flats of the same apartment building. Who vacuums the floor at ten in the evening on a Sunday? Who is really blasting Backstreet Boys on full volume? Are the upstairs neighbours constantly arguing or are they maybe Italian? Who smokes in the corridors, and who can’t shut up during house meetings? All this and more in the new format Blok mladosti (a.k.a apartment complex of youth). Since we will invite guests from abroad, Improholics, the show will be held (mostly) in English. We just hope they won’t forget to bring slippers! 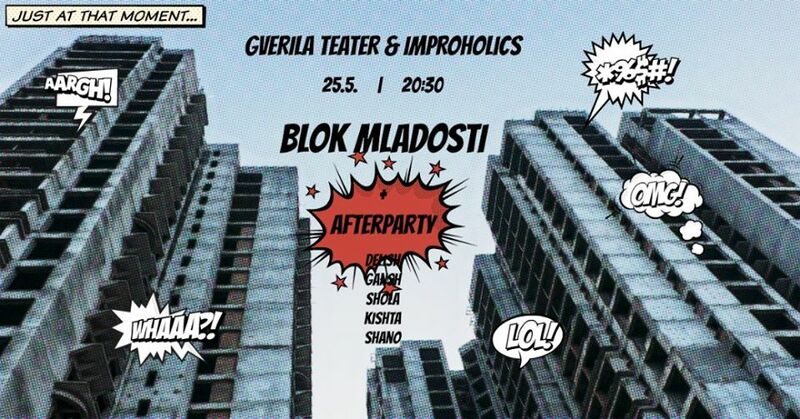 On the Youth Day, Gverila Teater invites you to the long-awaited party where Gverila DJs (Delish, Gansh, Shola, Kishta, Shano) will take you through the night with a collage of funk, house, techno and many hits found in between. All-night action for all those eager of dance and joy on the dance floor. Come unleash your inner party animal.